Welcome to the first episode of Ask the Oiler! 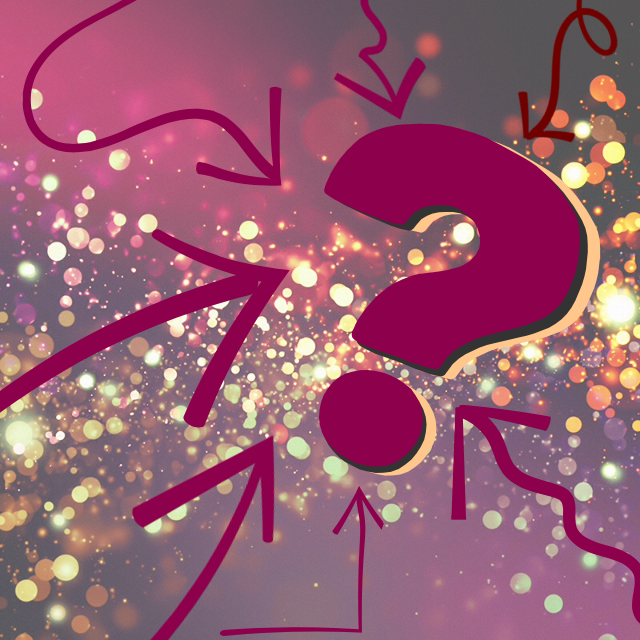 We received a couple of questions and thought a video would be a fun way to answer them. Do you have a question for us? Use the contact form to the right to send us your questions! Episode 2 will air later in May! You can click below to view our video or use the link below to view it directly on You Tube. So, you're wondering where you can learn more about all this oily goodness. There are several options for you! 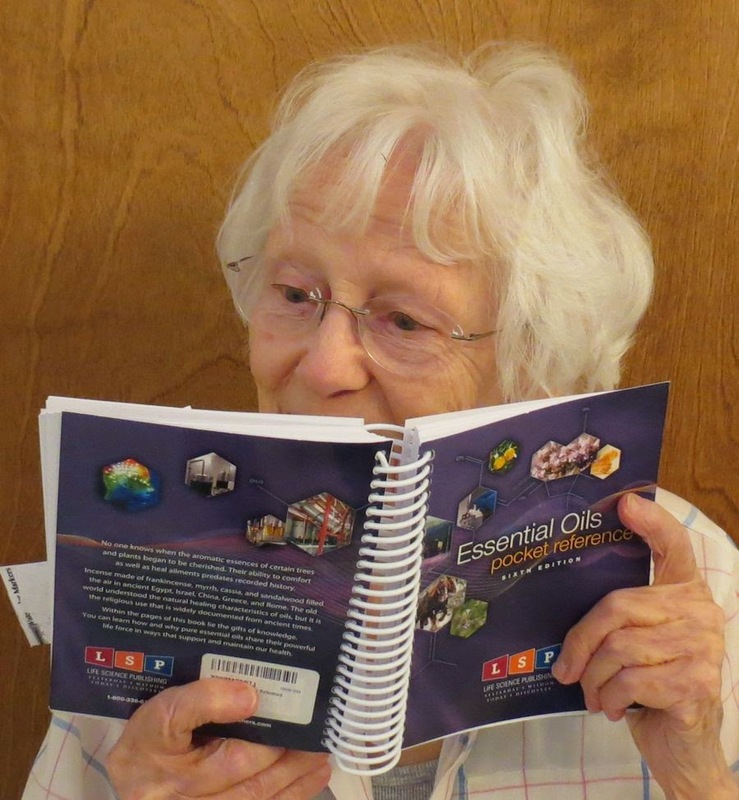 Here is Charlotte (Ann's mom, she's almost 90) reading about her oils in her Essential Oils Pocket Reference guide. You can get them on Amazon for about $25. 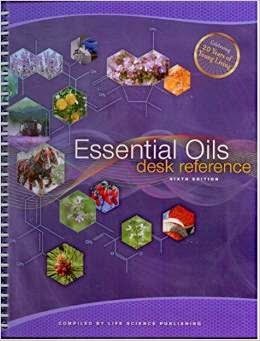 The book shown below is the larger book, Essential Oils Desk Reference (all 800 pages of it). There is a TON of information in there but you'll pay a little more for it (about $70 on Amazon). The information covers each individual oil and each oil blend. Invaluable! 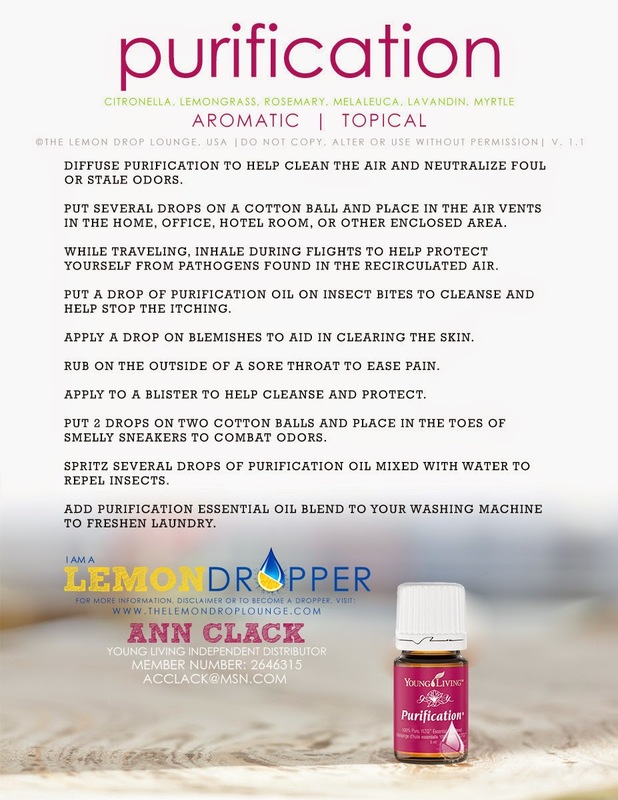 Purification more than odor removal! Now that you have seen Purification in action (see the earlier post here). Here is an awesome list of what this powerful oil can do for you!! It is really a wonderful addition to your arsenal of defense! Here is a little tidbit of information that I learned the other day........ Did you know that stinky feet may indicate a deficiency of magnesium in your diet? So, if you have stinky feet, use Purification while you're getting more magnesium in your diet! Work your way to sweet feet! 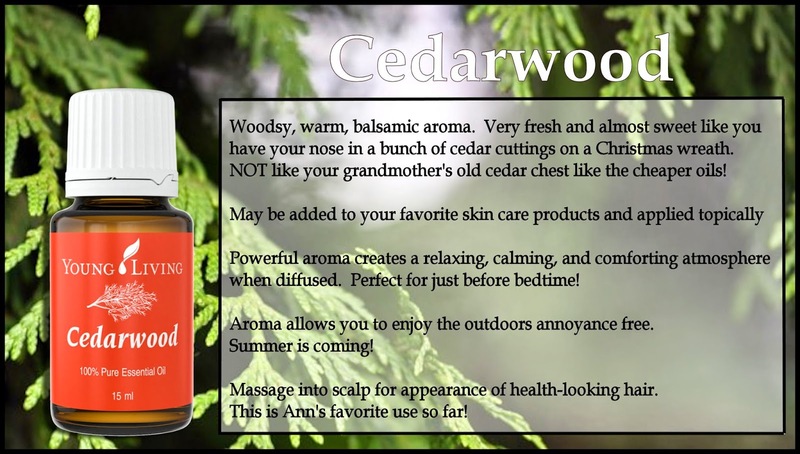 Since Ann's No Poo recipe used Young Living Cedarwood Essential Oil, we thought that you would like to see more about the oil! Is No Poo for you? Last May, Ann was taking her shower......... we know...TMI.....but hang with us and you'll see why we are starting there. While waiting for the conditioner to sit and do it's thing, she was reading the labels of her shampoo and conditioner because she had just learned about an ingredient that wasn't so hot. OH MY! There it was......both products had that ingredient and it got her to thinking about what she could use to shampoo her hair without that particular chemical. She was slowly trying to eliminate as many chemicals from her morning routine as possible. What would she try? Then she remembered one of her rubber stamping friends who had tried a No Poo way to keep her hair clean. Sounds icky but it isn't.....really!! With a little bit of trepidation she decided to give it a go. After all, if it didn't work, it wasn't the end of the world. One tablespoon of Apple Cider Vinegar in a small plastic container. She used Braggs Apple Cider Vinegar. Take shower like normal. 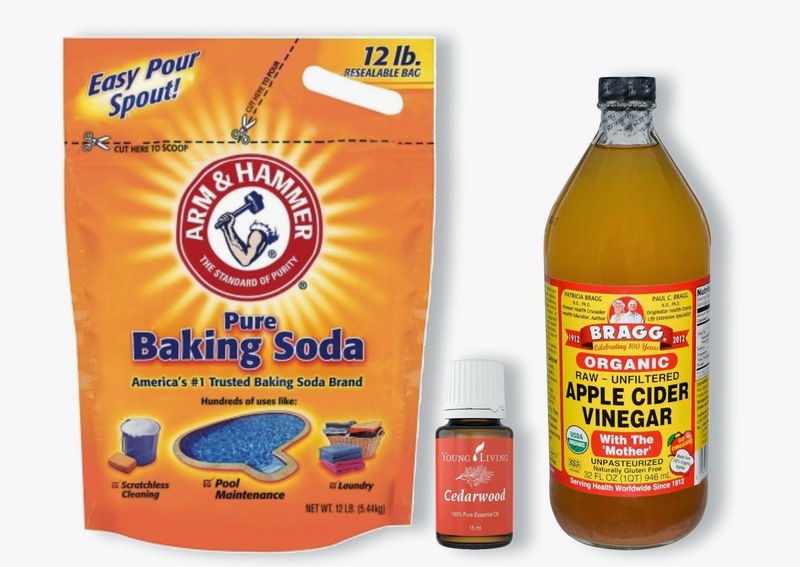 When you are ready to shampoo, add about 1 cup of water to the container with the baking soda mix and swirl around to dissolve the soda. Pour over your hair concentrating on the roots. Rub into the scalp and pull out to end of the hair. There won't be any suds but it will feel soft in your hands. Leaving it in for about a minute is good. Rinse out. Rinse your plastic container out and pour in the vinegar. Add about a cup of water. Pour over your hair and let sit a little before rinsing. You may go through a period of oiliness as the scalp re-calibrates its oil production. You see ......shampoos strip the scalp of natural oil making it produce WAY more than is necessary. BUT, don't despair. This doesn't take too long. You'll find that you can go about a week before needing to 'shampoo' and between 'treatments' Ann just wets her hair down massaging the scale without any soda/vinegar just so she can style. Those of you who use hair product would want to rinse out all the product frequently. Some say that this makes their hair too dry but Ann hasn't found that to be the case for her! If you do, adjust the amount of soda so you are using less or treat your hair less often. Leah said that she was going to be giving this a try. 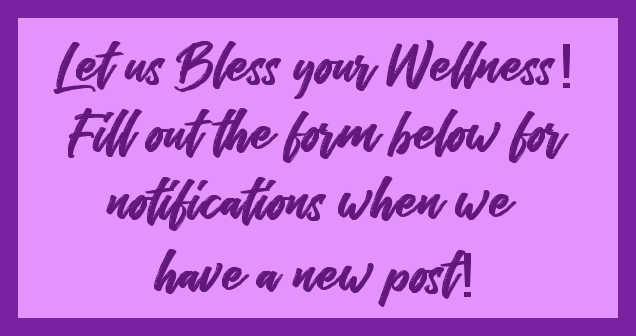 So......one post in the future will give you her feedback. If you decide to try No Poo, let us know how it went. Since our toothpaste recipe uses Thieves Essential Oil we thought you would like to read a little bit about the history of Thieves. In Arthurian times, punishment was often very harsh according to our current standards. One of the most common crimes was theft. The average person in the 15th century was of lower class, thus many had to steal in order to feed themselves and their families. These offences were punishable by public torture and humiliation, which included: stoning, beating and whipping. In some extreme cases, thieves could be hanged. Then in comes the problem of plagues in the 15th century. The plague that was most notable at the time was the Bubonic (Black) plaque, spread by fleas (carried by vermin such as rats). It had the worst mortality rate of any disease of the century at 50 - 70%! The outbreak of the plaque spread so quickly that even the Italian writer Boccaccio said its victims often "ate lunch with their friends and dinner with their ancestors in paradise." It started in China and by August of the same year had spread as far as England. They called it "The Black Death" because of the black spots it produced on the skin. Within five years, 25 million people were dead - one third of Europe's population!! After the worst was over, small outbreaks continued for centuries. The legend is of four thieves who were captured and charged with robbing the people who had died or were dying from the plaque. When they were caught and brought to justice (if you can call 15th century punishment actual justice), the magistrate offered a lesser sentence if they would reveal how they were able to rob and not contract the disease. They shared their recipe of a special concoction of aromatic herbs, including garlic, cloves and rosemary which they rubbed on themselves before committing their crimes. Now, Thieves is available for your use to protect yourself! 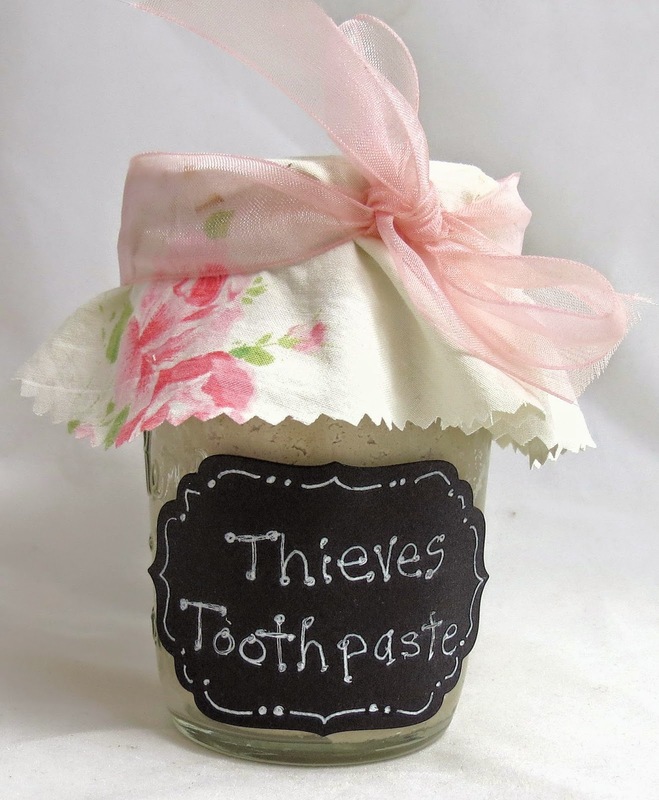 Below are some ideas for the use of Thieves, other than the toothpaste recipe. Then further below the information sheet is another link to other products that contain Thieves Essential Oil. If you are interested in other products containing Thieves, Click Here. Do you know your oral health is important to your overall wellness? Good oral health can reduce heart disease and cancer. For these reasons and because 'Who doesn't want a pretty smile? ', this post is dedicated to sharing a few ways you can naturally increase your oral health. First stop is oil pulling. This is one of the oldest and most powerful ways of improving oral health. This ancient practice involves swishing vegetable oil in the mouth for 5-15 minutes. Coconut oil is now a common favorite for this practice. It is important to push the oil under the tongue and between the teeth since that is where most of the microorganisms reside. The act of swishing the oil in your mouth 'pulls or extracts' the bacteria and fungi from the crevices of your mouth. After the 5-15 minutes you spit out the oil, don't swallow it, this is because all the bacteria now in the oil. To increase the benefits of oil pulling you can also add an antiseptic essential oil such as clove. Note: Spit into the garbage, not down the sink. You don't want to clog up your drain! Is it good or bad? People fall on both sides of this fence. We're not here to debate this topic. Xylitol while being a sweetener is also a water-soluble antiseptic. It is derived from birch tree sap and commonly found in dental products and chewing gum. We added it to our homemade toothpaste due to these reasons and because we wanted something to take the edge off of the essential oils we added for flavor. You can read more about Xylitol's roll in oral health by clicking here. Many common brand toothpastes contain very large abrasive particles that quickly wear away your tooth enamel. Not having a thick enamel myself I felt it was time to find an alternative. Tooth enamel is not something the body regenerates and once lost, it is permanent. As you lose tooth enamel, it exposes the softer dentin material underneath it. This INCREASES YOUR RISK for tooth decay. The particles in your toothpaste should be super fine for this reason, and yet be strong enough to scrub away the built up plaque. Particles in some whitening toothpastes are much bigger and sharp edged than the particles in our recipe. 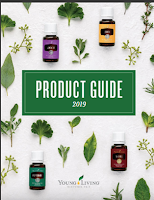 For those of you with the Essential Oils Desk Reference Guide, look on Page 334 for an excellent example of particle sizes. Small glass container to store product. Distilled WATER - about 3 Tablespoons if your mix seems too hard. We didn't add that when filming and our mix was a little too firm. 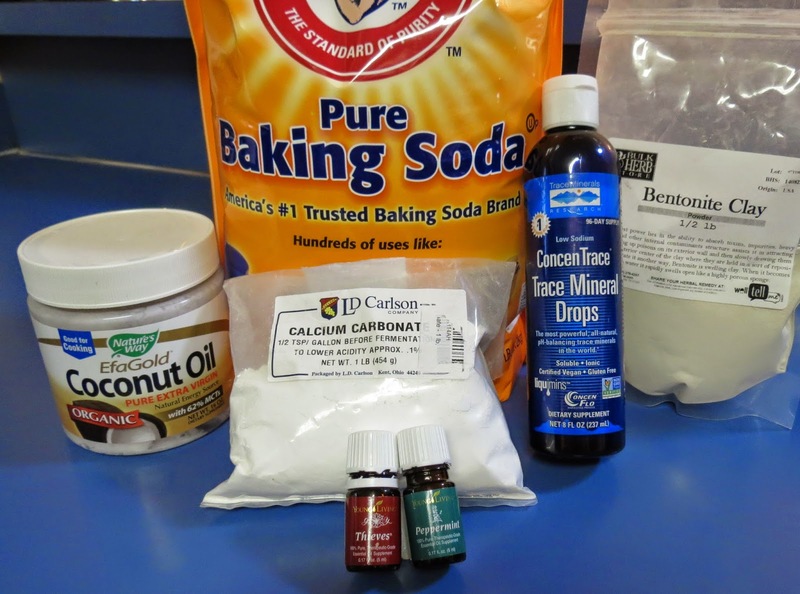 Directions: Combine Calcium powder, Xylitol powder, baking soda and melted coconut oil. Stir until well mixed. Add Bentonite clay, stir until well mixed. Add oils and trace minerals. Mix in well and store in a glass container such as a small mason jar. *Note: Add your powders slowly to avoid them flying into the air. You do not want the powders to enter your airway. Using a medical mask is optional. Remember to send us your questions! We will video tape our first "Ask the Oiler" in just a week or so! Send your questions now!! Just use the contact form in the right column and we'll get them! Lemon is the Star Today! One of the other ingredients in Leah's Moisturizer Recipe is Lemon. The Moisturizer isn't the only thing the Lemon is good for! Here is a great little graphic that shows you more! 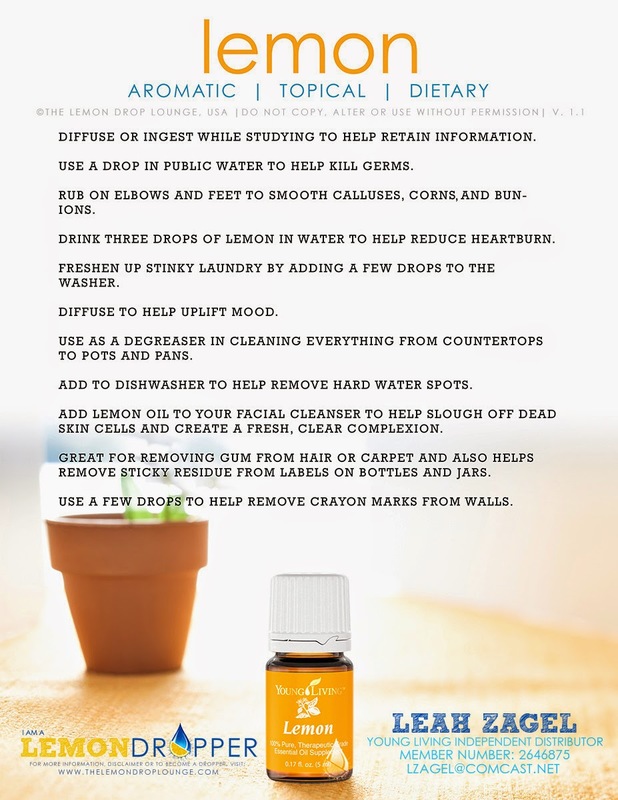 Leah and Ann have been putting Lemon Essential Oil* in our water during the day and it is very refreshing! If you decide you want to use the Lemon Essential oil in your water, please start slowly. Lemon is detoxifying. Using too much at once can be a shock on your body. Start off with just a drop or two in your morning water. Then build up from there. 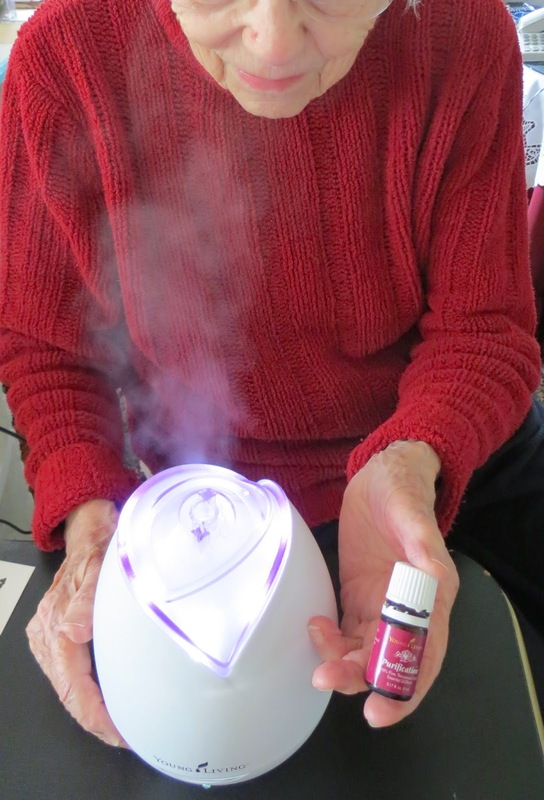 Ann also uses it along with Peppermint in her diffuser for the most uplifting mix! Stay tuned! Coming up next will be information on how we make our own toothpaste! * Not all Lemon essential oils are created equal. Young Living Lemon is very pure and is safe to ingest. Not all Lemon oils are safe to ingest! If your bottle says Do Not Ingest, don't!